The closing date for news in this issue is 2 April. Labor Must Ground Unsafe Planes! The details that have emerged after two fatal crashes in less than five months of the Boeing 737 Max, an aircraft model that first rolled off the assembly line in 2017, all point to one unmistakable conclusion: capitalist production for profit kills. Locked in fierce competition with the German-French aerospace conglomerate Airbus for control of the world market, the U.S. manufacturing giant early in the decade promised airlines a narrow-body aircraft that would minimize fuel and training costs, to be delivered within a few years. To meet this deadline, Boeing threw safety out the window with the full complicity of the Trump and especially the Obama administrations, while also pushing speedup on its workforce. Now, 346 people are dead after Lion Air Flight 610 on October 29 and Ethiopian Airlines Flight 302 on March 10 plunged from the sky. 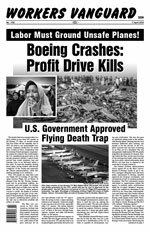 Boeing management and its government enablers are criminals, pure and simple, for foisting flying death traps on flight crews and the public. For the bosses, whose primary concern is profit, the deaths of workers and passengers are just part of the overhead of doing business. From the plants to the airports, mobilizing labor’s power is the only way to effectively establish and enforce air safety. · 미국 제국주의는 베네수엘라에서 손을 떼라! · ¡Victoria a la huelga de las maquiladoras! · Ireland: Victory to the nurses strike! · 미국 관세들과 군사적 도발들을 타도하라! · Maestros de L.A.:	¡A la huelga para vencer! · L.A. Teachers: Strike to Win! · 감금 반대! 이주자들에게 완전한 시민권을! · Gilets jaunes : Le prolétariat doit prendre la tête de la lutte ! · Νίκη στους Εργάτες στην COSCO! · ¡No a las detenciones! ¡Plenos derechos de ciudadanía para los inmigrantes! Fight for free abortion on demand! · Victoire à la grève des cheminots ! A bas la liquidation du statut ! · Precz z wyrokami sądowymi przeciw komunistom! Για ένα Λενινιστικό κόμμα στην Ελλάδα! The International Communist League (Fourth Internationalist) is a proletarian, revolutionary and internationalist tendency committed to the task of building Leninist parties as national sections of a democratic-centralist international. Our aim is the achievement of new October Revolutions—nothing else, nothing other, nothing less. The ICL bases itself on Marxist historical, dialectical materialism and seeks in particular to carry forward the international working-class perspectives of Marxism developed in the theory and practice of the Bolshevik leaders V. I. Lenin and L. D. Trotsky and embodied in the decisions of the first four Congresses of the Communist International as well as key documents of the Fourth International such as the Transitional Program (1938) and "War and the Fourth International" (1934). We also look to James P. Cannon, a leader of the early American Communist Party who was won to Trotskyism and went on to become a principal founder of the Socialist Workers Party (SWP), working in close collaboration with Leon Trotsky. The origins of the ICL are in the Spartacist League/U.S., which began as the Revolutionary Tendency in the SWP and was bureaucratically expelled in 1963. Our ICL "Declaration of Principles and Some Elements of Program" was modeled on the Declaration of Principles adopted at the 1966 founding conference of the SL/U.S. Adopted at the Third International Conference of the ICL in early 1998, the declaration presently exists in English, French, Spanish, Portuguese, Japanese, Chinese, German, Russian, Polish, Italian, Turkish, Indonesian, Greek, Korean and Tagalog. In this post-Soviet period, marked by a deep regression of proletarian consciousness, we continue to be guided by Trotsky's statement that "the task of the vanguard is above all not to let itself be carried along by the backward flow; it must swim against the current." Reforge the Fourth International, world party of socialist revolution!